These are all the Blogs posted in February, 2011. Been a while since my last post... but we have not been cruising... docked in Punta Gorda, FL at Fishermen's Village Marina... enjoying the area very much! This morning we left Fishermen's at 0500 bound for St. Petersburg, FL... we have to return the boat to Vilking Boatworks there and have some issues taken care of with a previous bottom job they did for us. 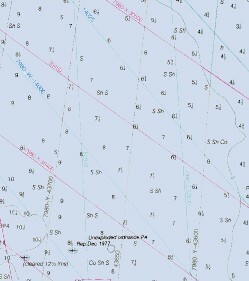 It's approximately 120nm from Fishermen's Village Marina to Viking Boatworks and we plan to make the trip in one day... one LONG day... should take approximately 15 hours. We are scheduled to be hauled out on March 1st at 0800. Update to the trip after we arrive to St. Pete. We arrived in St. Petersburg at approximately 1900 hours and quickly stopped at the St. Pete Municipal Marina to walk the dog... easier than dropping the dinghy into the water... anyway, Beech did her business and we left the marina and moved just north of it into Vinoy Basin located at N27°46.582', W082°37.752' and anchored. We appear to be the only power boat anchored in the basin but there are about half a dozen sailboats anchored around us... very nice location to drop the hook... St. Pete skyline surrounds you on three sides... very pretty. We have about an hour and a half to go in the morning to get to the boat yard... plan to leave about 0600 to be sure we are there by our scheduled 0800 haul out.